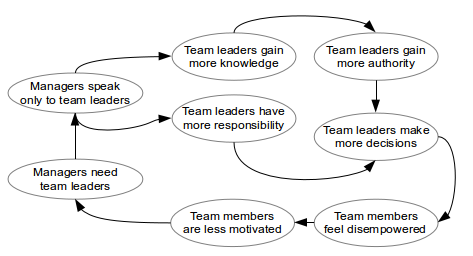 When adopting Scrum, a common concern for both teams and managers is “What do we do with the Team Leader role?”. Often, TLs become SMs, but the two functions have subtle differences. This role is rooted in command and control thinking. The reasoning behind the position is that someone needs to be responsible for the team’s results. She/he will be the team’s interface with the outside world and has a role in taking technical decisions. Unfortunately, having a team leader has the risk of reducing team involvement, which increases the need for a team leader. See the diagram below. The more managers rely on the TL to get the job done, the more there will be an imbalance in the team regarding knowledge and motivation. It will ultimately lead to increasing the TL’s authority and further demotivation in the group. As a result, the total value generated is suboptimal. It is up to the TL to recognize the signals and mitigate team degradation. So, how does Scrum solve the problem? Scrum does away with the Team Leader role but proposes the Scrum Master. The SM role assumes servant-leadership, a way of leading people without having formal authority over them. The SM resorts to setting a shared vision, involving everyone in the decisions, coaching the group. It leads to an entirely different team dynamic. Because there is no longer a central decision point, all team members are asked to contribute equally. The increased motivation and responsibility lead to better results which, in turn, increase the trust and management’s willingness to treat the team as a whole. When transitioning to Scrum, task assignment, and providing estimates become team responsibilities. Talking to outside people is done both by the SM (for removing impediments) and the team (everything else). The only question left is who makes technical decisions. Many agile coaches suggest that all team members should have an equal say when it comes to technological aspects. While I agree with it as an ideal, my experience is that even in agile teams one or two technical leaders emerge. Everyone else defers to their judgment and expertise when it comes to tricky technical problems. The team dynamic described in the second diagram is not something that magically happens overnight. If the team is not used to making estimates or having a say on technical issues, they usually won’t start doing it without help. Its the responsibility of the scrum master to build an efficient team that is autonomous and self-organized.